PS4 or Xbox One: which is it going to be? 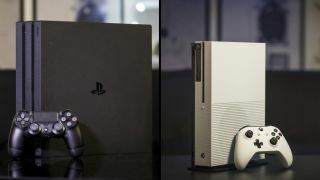 Both of Sony and Microsoft's current-gen gaming consoles inspire fierce loyalty in their respective camps, and it can be fiendishly difficult to make a clear-headed decision between the two. To help you make that impossible choice, we've made a comprehensive list of all the key differences (and similarities) to keep in mind when buying an Xbox One or PS4. There's no doubt that the PlayStation 4 has taken the lead in sales, but both have their pros and cons – and the mid-gen refresh has certainly given us a lot more to think about. We should also mention that the next generation of consoles – namely the Xbox Scarlett and the PlayStation 5 – could be with us as early as 2020. If you don't want to cruelly deprive yourself of a great home console before that, here's how to pick between the PS4 and Xbox One. At the moment, Sony has two separate versions of the PS4, the standard slim version that's capable of HDR playback, and the more expensive 4K-capable PS4 Pro. On the other side of the fence is the Xbox One, now available in the 4K HDR-ready Xbox One S, and the ultra-powerful Xbox One X – a console that not only does 4K HDR native gameplay but, in some cases, plays games at 60 frames-per-second too. What that means is if you already own a 4K HDR TV, you should probably opt for a PS4 Pro or Xbox One X to really get the highest visual fidelity from your console. If you're gaming on a 1080p TV, however, an Xbox One S or PS4 Slim make more sense and will cost you less. But what about games themselves? And the entertainment options you've got? How's the online reliability and how are the respective marketplaces? Which platform is easier to get around? Which has better first-party applications? The PS4 and Xbox One prices seem to change by the week, with price drops and bundle deals coming and going faster than handheld PlayStation systems. Add in special events such as Black Friday and it can be hard to keep track. While the original iterations of the Xbox One and PS4 launched in the same month, the console upgrades have been a bit more staggered, adding a little bit more confusion to the Xbox One vs PS4 question. Want to compare the slim consoles? Check out our guide to the PS4 Slim vs the Xbox One S.
Want to compare the 4K HDR consoles? Our PS4 Pro vs Xbox One X guide does just that. Look, we want to save you some time here in your PS4 vs Xbox One deliberations. So the box on the right will take you through some of the finer details of each console with their upgraded models, if that's what you're after. Otherwise, we'll be comparing the ecosystems of each platform in the rest of the article below. For our top deals check out our US PS4 bundles, UK PS4 bundles, and Australian PS4 deals pages. Or check out our Xbox One X bundles, US Xbox One bundles, UK Xbox One deals and Australian Xbox One deals pages. The Xbox One S improved on the design of the original Xbox One by cutting down a lot of the heft, and removing the gigantic power brick, making use of an internal power supply instead. It measures 11.6 x 8.9 x 2.5 inches, and unlike the previous version includes a 4K Ultra-HD Blu-ray player – it will even upscale 1080p games to 4K, as long as you have a TV that can support it. The Xbox One X might be heftier than the Xbox One S, but it’s still considerably smaller than the original Xbox One, coming in at 11.81 x 9.44 x 2.36 inches and weighing around 8.4 lbs (this console also has an internal power supply). This is the high-powered version of the Xbox One, with native 4K gaming as well as a 4K Ultra-HD Blu-ray player (something not even the PS4 Pro can boast). Which console has better specs under the hood? Our guide to the Xbox One X vs Xbox One S will clue you in as to the differences in the Xbox family. Starting out on the PS4 side of the equation, the PS4 Slim is straight up the smallest of the major consoles available right now, measuring in at 10.4 x 11.3 x 1.5 inches and serving as the baseline PS4 for most consumers – a complete replacement for the original PlayStation 4. It doesn’t give you 4K resolutions, even for video, but it can still play every game in the impressive PS4 library. The PS4 Pro was the original 4K console, coming out an entire year before the Xbox One X – even if Microsoft's box eventually outpowered it. It measures 12.8 x 11.6 x 2.1 inches. While the PS4 Pro does to at least some extent support native 4K gaming, it doesn’t include a 4K Ultra-HD Blu-Ray Player, an omission that has attracted some flak for Sony over the last year or so. The PS4 Slim is the smallest of the major consoles. You can't upgrade Xbox One's internal hard drive, but you can on the PS4. The PS4 Pro and PS4 Slim have similar inputs, although they are slightly different. Each has a single HDMI out, a single USB port in the back (two in the front), an Ethernet port, and power. The only difference between the Pro and the Slim is that the Pro has an Optical Audio out, while the Slim drops it. One of the most compelling things about the connectivity of the PS4, however, is that both versions allow users to swap out the internal hard drive with another one of their choice. All versions of both the Xbox One and PS4 support 802.11 ac Wi-Fi and Gigabit Ethernet – so no matter which console you decide on, you won’t have to worry about network compatibility. The Xbox One S now requires an adaptor for the Kinect, though you're unlikely to need one. PS4 and Xbox One are devoid of remarkable characteristics on the front. There's a Blu-ray/DVD combo drive to the left (which can play Ultra HD Blu-rays on the Xbox One S and Xbox One X) and their respective, muted-color logos to the right. PS4 has a pair of USB ports tucked between its sandwich-like halves next to where the disc drive is located. One thing the Xbox One pulls ahead with is smart home integration. 2018 saw Microsoft announce support for Amazon's Alexa voice assistant, meaning your Xbox One can communicate with Amazon's line of Echo smart speakers or other Alexa-enabled devices – and might be a practical alternative to using voice commands through the Kinect. In the US, Microsoft is even giving away free Echo Dots in Xbox One bundles.